The perfect companion piece to “Hatufim” maybe? In “The Gatekeepers”, the former and current heads of Shin Bet, the Israeli domestic security service, talk about their job, their country, their missions, their killings, their victories and defeats. Dear goodness, this is astonishing. It is one of the most impressive documentaries I have seen in a long time, maybe ever, both in terms of content and form. The coup, of course is, to manage getting all these people in front of cameras and talk about their work. Having two or three of them would have exposed the film to maybe insurmountable criticism. Having those six means that the film can make a case. This case is that, from the perspective of the people tasked with keeping Israel safe against its enemies, Israel’s strategy has been dead wrong and counterproductive for decades. It is clear that these protagonists’ appearance on camera has political aims: some are currently in political office, others have open bills to settle (with unsupportive or ignorant politicians, and with each other). That they still agree on some fundamentals in their own country’s security policy is all the more perplexing. By maintaining an eye-for-an-eye approach, by overkilling and refusing to talk to the opposing sides, their country establishes a never-ending balance of mutual terror. Terror by Hamas and Islamic Jihad against Israel, terror by Israel’s domestic right wing groups against Israel, and terror by Israel against anybody who appears not to be on their side. The notion that one side’s terrorist is the other side’s freedom fighter is formulated as if it had never occurred to anybody, while it seems that in the political climate of the region, it has just been more convenient to ignore. None of the six is confused about the impossibility to create peace based on such an approach, and all of them are thoroughly disappointed by the succession of governments in their country to engage in a fundamental shift. This goes as far as virtually naming Netanyahu for creating the atmosphere that almost necessarily led to the murder of Rabin, of exposing Shamir as a stubborn politician completely unwilling to engage in a conversation about paths to peace. These men are in no position to make moral judgments. This is what makes their positions so strong. They were killers by profession, some of them directly attributable to illegal executions. There livelihood was assassination and elimination. These men have spent their work life in secrecy, have taken responsibility for executing or not executing suspected terrorists, have been made responsible for collateral killings, for ruthless executions, for war mongering and for being too soft. They do not bring vague political notions to the table. Rather, they bring observations: In their line of job, they could directly observe causes and effects. And without pathos, they agree on assessing the effect of Israeli’s policy towards the Palestinians and the settlement areas to be devastating for Palestinians, for the peace process, and in consequence for Israel. You do not hear very often the analogy drawn between the Israeli occupation policy and Nazi Germany’s occupation policy voiced by a former high-level Israeli civil servant. 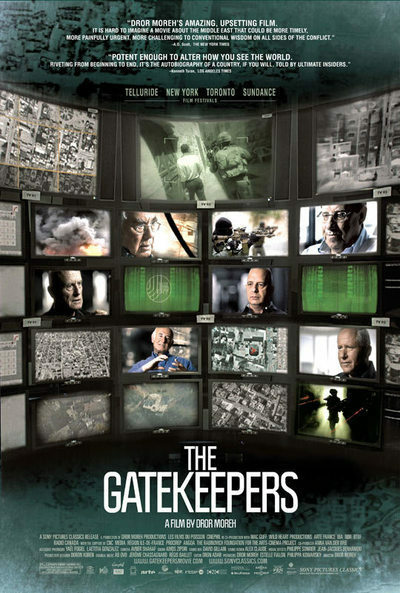 In “The Gatekeepers” you do hear it, and in the sober way a political historian would formulate it: the effect of occupation and perennial violence, the threat of soldiers storming your house in the middle of the night and taking away your father and husband… that effect is not guessed at but assessed by these heads of intelligence, and their assessment is that it has to stop if peace is to be established. The talking heads are complemented in a very impressive way by news footage and by archive material that has been very cleverly animated. Based on still photos, 3-dimensional layouts are developed where this either useful to get a better understanding for the situation described (as in the hijacking of the “300 Bus” and the killing of the hijackers) or to create atmospheric intermissions. I never felt these animations to be director’s vanity, they serve the purpose of the story telling and (mostly) remain as humble as necessary. Satellite footage adds to this, pulling the tell-tale of assassination and execution from story to stark and sober reality.